Involtini is an Italian word that refers to little "bundles" that feature some sort of filling wrapped in an outer layer. Sometimes referred to as rollatini in the U.S., it means essentially the same sort of food but it is not a term that would be used in Italy. Often served up as little bites in between meals or as an appetizer, the filling of an involtini may consist of meat, seafood, nuts, cheese or vegetables, while the outer layer is sometimes thin slices of meat, seafood or vegetables. 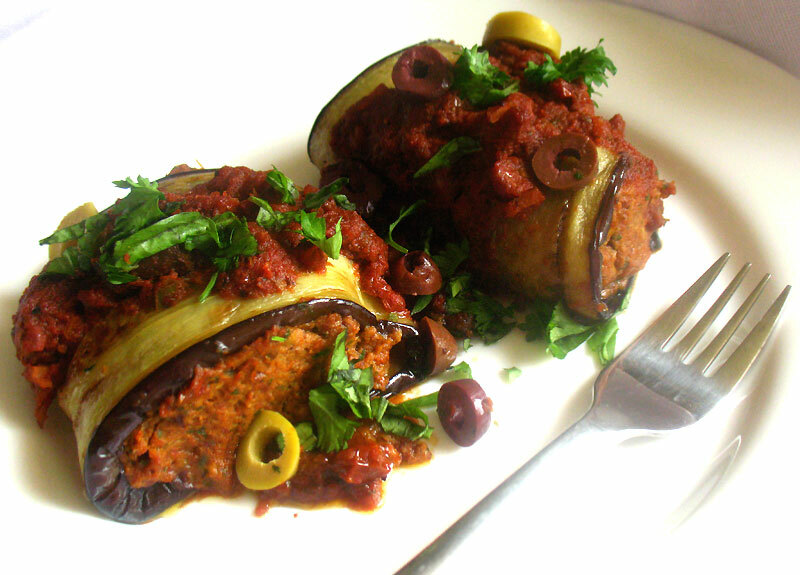 Eggplant involtini is a vegetarian classic featuring eggplant as the outer layer, and the filling is often a cheese-based blend with herbs, simmered with tomato sauce. The possibilities are many indeed and fodder for eager cooks. Though for years I have been especially smitten with trying new ways to feature the undeservedly spurned eggplant, until now I had not made eggplant involtini. The variation I offer up here is not only vegetarian but vegan-friendly too. 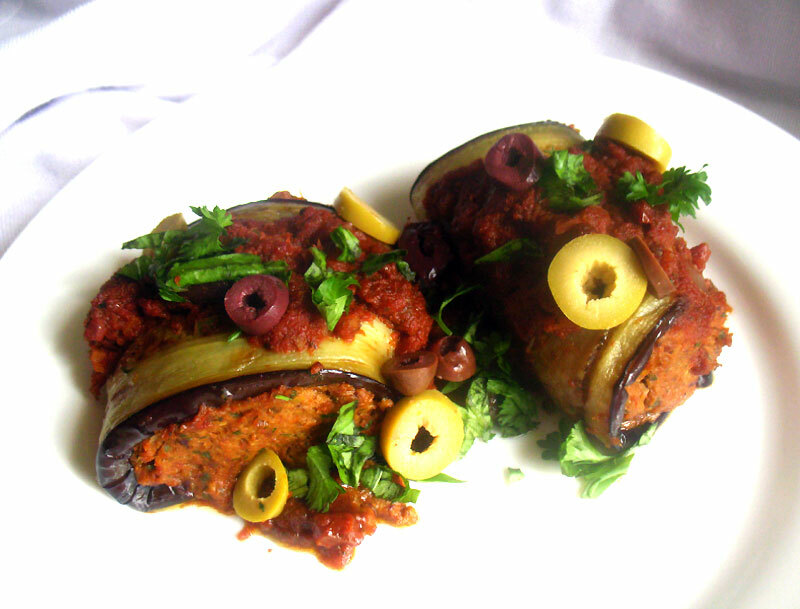 The filling — wrapped up in slices of lightly fried eggplant — is a rich blend of roasted eggplant, tomato, onion and garlic, along with olives, sun-dried tomatoes and herbs. These involtini are quite hearty and substantial, and are meant to be served as part of a main meal rather than as hors d'oeuvres. I had some frozen homemade marinara sauce that had been left over from a previous dish. I thawed that and used it for a tomato sauce that tops the eggplant rolls and, because it was a chunky portobello marinara sauce, it added a whole new element to the dish. Any good tomato sauce will do, so make your own ahead of time or buy your favorite prepared jarred variety from your local grocer. I prepared these involtini as part of special Italian themed meal for a quiet and intimate dining experience. This elegant eggplant dish ended up being the star of the meal, and it was served with a heavenly homemade rustic bread with olives and a Puy lentil soup with Swiss chard and Arborio rice. Preheat an oven to 375° and line a baking sheet with parchment paper. Peel one of the eggplants and dice. Transfer to a large bowl and toss in the fresh tomatoes, onion and garlic, 3 tablespoons of olive oil. Season with a bit of salt and pepper. Toss well to coat. Spread this mixture onto the prepared baking sheet and roast for 30 minutes, turning the vegetables part way through the cooking time, until browned and tender. Remove from the oven and let cool for 10 minutes. Meanwhile, soak the sun-dried tomatoes in hot water for 30 minutes, then drain and chop. Set aside. Transfer the cooled roasted vegetables to a food processor. Add the sun-dried tomatoes, basil, olives, parsley, nutritional yeast, paprika and cayenne. Process until combined and fairly smooth. Season with more salt and black pepper if desired. Transfer to a medium bowl. Trim the ends from the remaining eggplant and slice into about 8 thin slices (about 1/4 inch thick). Heat some of the remaining olive oil in a large non-stick frying pan over medium-high heat. Add a few slices to the pan and cook for about 3 minutes per side until browned. Add more oil to the pan as necessary. Gently remove the slices and transfer to wire racks set over sheets of paper towel. Repeat with the remaining slices of eggplant. Oil a 13 &#times; 9-inch glass baking pan and preheat an oven to 375°. Spoon about 1/4 to 1/3 cup of the roasted vegetable mixture onto half of a eggplant slice. Roll the slice into a log and place seamside down in the baking dish. Repeat with the remaining eggplant slices and roasted vegetable mixture. Spoon the tomato sauce over the rolls. Bake for 10 to 12 minutes until the sauce is bubbling. Serve hot garnished with fresh chopped basil or parsley and a sprinkling of olives if desired. 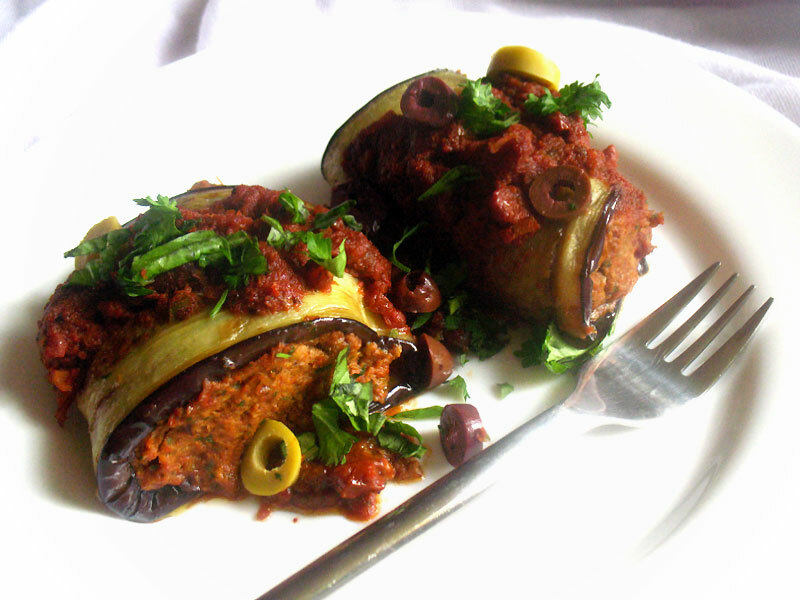 I haven't made Aubergine Involtini for a very long time and you have reminded me, to do so and make the effort again. Your filling with olives interests me, as mine has often been with veggie mince 'meat'. So who knows, may give it a go. PS I made your nutroast, I really liked it, but never got round to taking a picture of it.